Why Are Moths Drawn to Flames? Around the world, moths make kamikaze dives into light bulbs and open flames with such regularity that they have their own idiom. What is it about lights that make moths so crazy? For a long time, scientists blamed the moon. Moths used the moon as a navigational beacon, it was argued, keeping it at a constant angle to their direction of travel in order to fly straight. Light sources used by humans, whether they’re campfires or porch lights, threw a monkey wrench into this system. The moon is far enough away that the angle between it and a traveling moth isn’t going to change much, even after the moth flies a great distance. With a closer light source, though, the angle changes considerably after only a short distance. A moth confusing a light bulb or candle flame for the moon, the hypothesis went, would notice this change and attempt to correct its path by turning toward the light. After just a few course corrections, the moth would set itself into a tightening death spiral towards the light and eventually crash into it, either going down in flames or thwacking its poor little head. Over the years, various holes were poked in this hypothesis. For one—and this is a big one—moths might not even use the moon for navigation. There isn’t much evidence for it, especially when it comes to the over 50 percent of moths that don't migrate and wouldn’t have much use a celestial navigation aid in their short distance travels. There’s also the fact that moths don't always circle around lights in a closing spiral like the moon hypothesis assumes. Most of the time, they actually head straight for it. Henry Hsiao, a professor of Biomedical Engineering at the University of North Carolina, has tracked moth flights as the bugs headed toward a light source and found that, most of the time, they fly in a straight line toward the light until they get very close, then veer off and circle at a steady distance. Hsiao’s observations led him to develop a new hypothesis. He’s unsure what causes the moth to make a beeline to a light, but thinks that the circling behavior at close ranges is caused by a visual distortion common to all sighted creatures called a “Mach band.” The band is the region surrounding a bright light that is perceived as being darker than any other part of the sky. Hsiao thinks that moths hang out in the band because they want the cover of darkness for safety, and wind up circling the light until their flight path takes them away from the it (or causes them to crash into it). 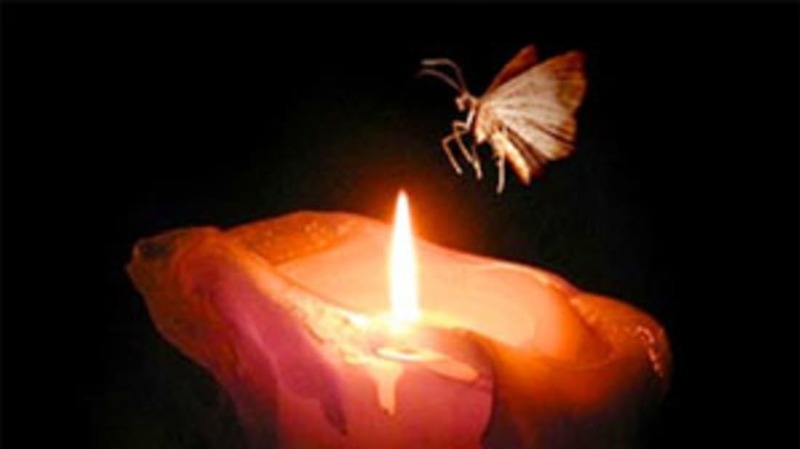 Another explanation, proposed by U.S. Department of Agriculture entomologists in the 1970s, is that the infrared light spectrum emitted by candle flames contains some of the exact same wavelengths of light given off by female moths' luminescent pheromones. In other words, it’s just male moths that are attracted to flames because they wrongly assume that they’re going to get lucky. This doesn’t explain their attraction to UV light, which doesn’t emit the same light wavelengths as moth pheromones, but it does say something very profound about the lure of love.